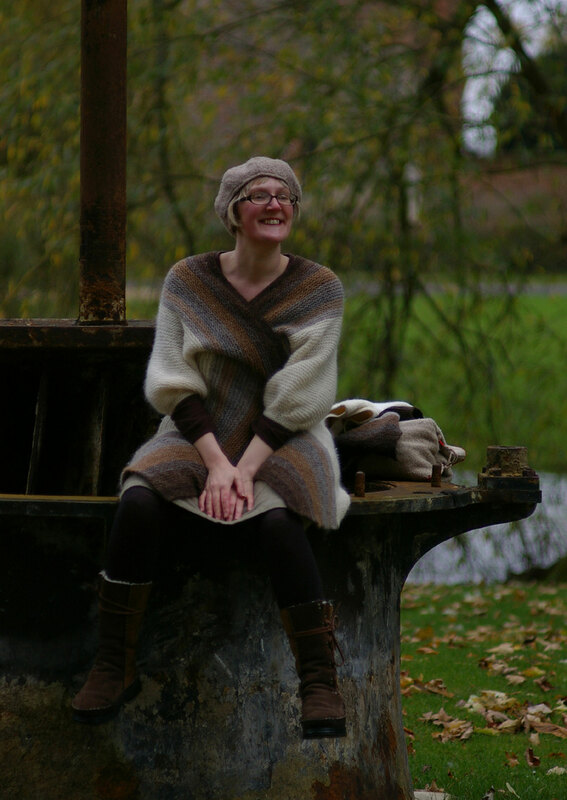 This post originally appeared on the Kate Davies Designs blog on the 1st of WOVEMBER 2013, and is republished here in celebration of sheep and wool! In case you hadn’t noticed, today is the first of WOVEMBER! I thought I’d begin the month by showing you a garment that, like no other I can think of, truly celebrates the glorious variety of British sheep and wool. It was designed by my good friend and fellow WOVEMBERIST, Felicity Ford, AKA, Felix. This year, Felix was the patron of Shetland Wool Week, (and if you’ve not yet heard / seen her singing the “Shetland Wool Song” I suggest you pop over to YouTube right now!) Back in June 2009, Felix and I and several other woolly friends met up at Woolfest. It was a wonderful weekend for all of us, and I well recall how Felix, over a jolly pint or two at the Bitter End in Cockermouth, toasted the glory of British wool, and explained to us how she was going to create a garment celebrating the diversity of sheep, inspired by what she’d seen at the show. Layter was the result, and, over the past few years, this marvelous original garment has evolved several times. It’s now available as two fabulously sheepy designs, for both adults and babies. I asked Felix to tell us more about the story of Layter. 1. What does “Layter” mean? “Layter” is a word from an old Cumbrian counting rhyme which shepherds used in the past for counting their sheep and it’s the number “seven”. The prototype of the design used wool from seven different breeds and since I found this wool in Cumbria at WOOLFEST, a title from that part of the world made sense. I love that when people ask me about “Layter” we end up talking about old shepherding traditions! 2. I have a very clear recollection of your infectious excitement at Woolfest in June 2009, upon perusing the marvelous breed-specific yarns that were available at the Blacker Yarns stand. Am I right in thinking that this was the moment the design was born? Can you tell us about this moment and the garment’s inspiration? The Blacker Yarns stand blew my mind! There were two deep containers full of balls of yarn from different sheep breeds. As I read the names on the ball bands and squished the yarns, I felt there was loads to discover about each one. I pulled out ball after ball and kept finding more names… Jacob, Border-Leicester, Manx Loaghtan, North Ronaldsay, Shetland, Teeswater… it was like a poem! 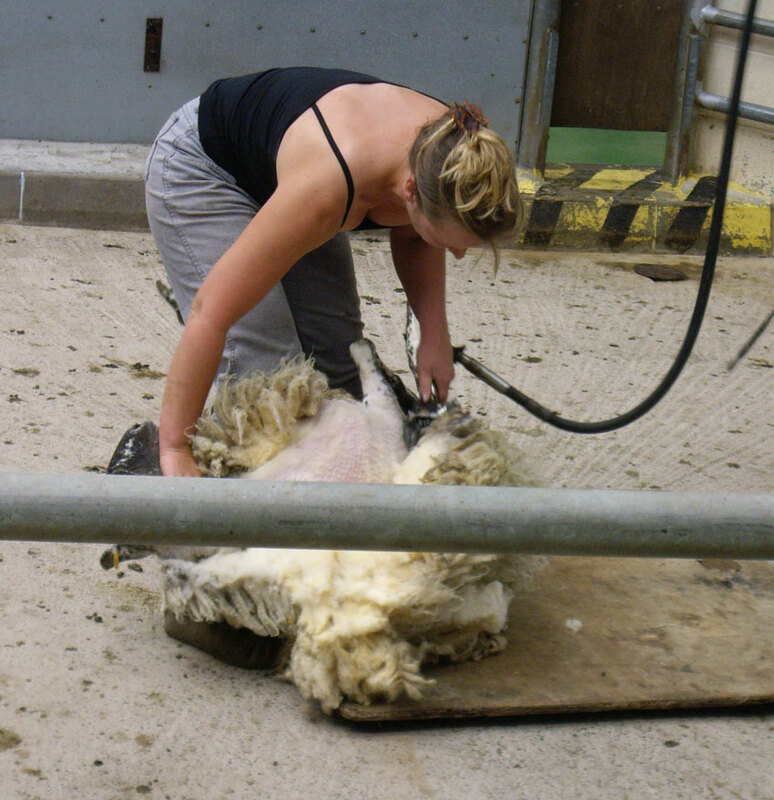 Additionally, I watched a shearing demonstration and was really impressed by how the shearer got the fleece off the sheep all in one piece. I realised I really wanted to knit something which looked like that, so yes – the design was born in the wonderful sheepy celebration that is WOOLFEST! 3. You then began knitting, and I remember first seeing (and admiring) the first incarnation of Layter just a few weeks after Woolfest. I know how you loved this garment and wore it loads. In many ways this design seems to epitomise your concept of ‘the slow wardrobe’! Can you tell us about how the original Layter has stood up to wearing since you made it? 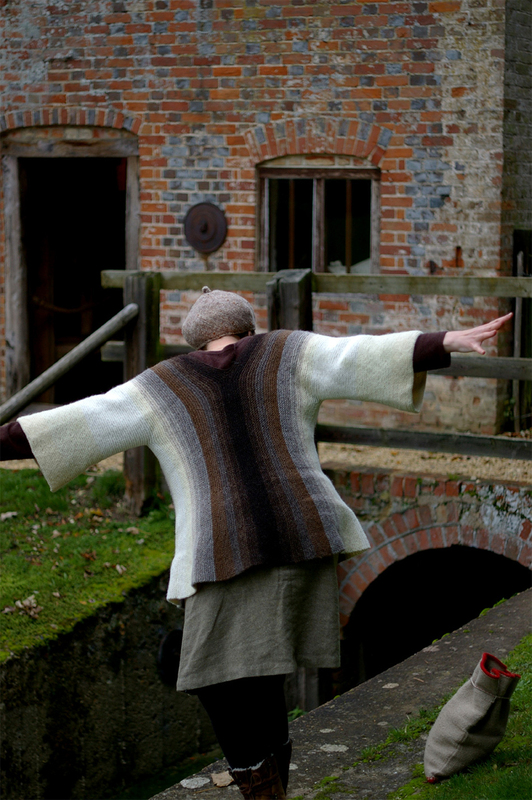 The first incarnation of Layter was knit at quite a loose gauge, which makes it drapey, and quite long and robe like! The fabric has relaxed with time, and the whole garment feels very feminine to me. I love wearing it with a dress, and that I can really hug it around myself in the cold! I am genuinely impressed with how well the yarn has worn; it hasn’t pilled or shed, and the stitches remain well-defined. The fibres have softened after four years of wear, and the whole garment has developed a very slight and pleasing bloom. The sideways construction means it can stretch a little bit if I wear it every day for a couple of weeks, producing a mildly limp appearance, but when this happens, I simply bung it in my washing machine on a Wool cycle and give it a good block! 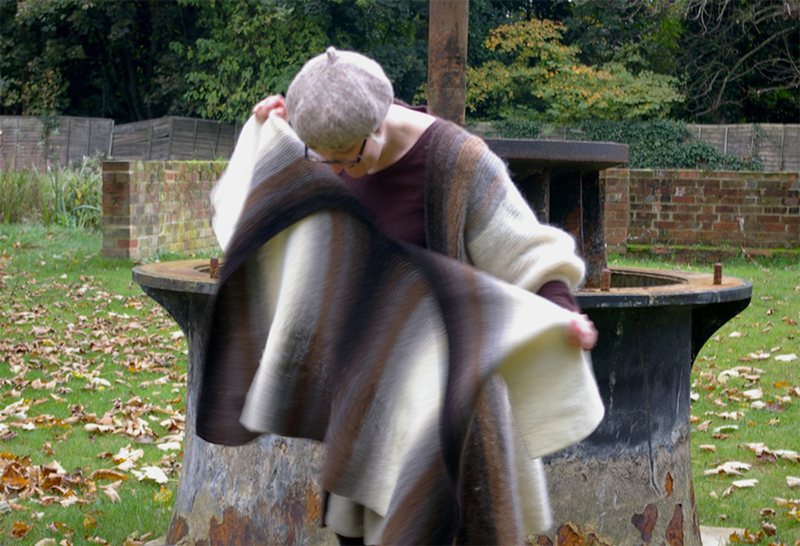 Layter does indeed epitomise my concept of ‘The Slow Wardrobe’; it is a 100% WOOL garment that I cherish and will wear for years to come; the yarn it is made of is durable and well spun; and the whole process of making it has made me more aware of different breeds of sheep and the unique properties of their wool! However perhaps most importantly, it sparks conversations about wool and sheep everywhere it goes. Because it is quite big and has those crazy sleeves, it does attract attention, and every time I wear it, people ask questions, and seem enchanted by the notion that the stripes are all from different sheep breeds. Folk immediately connect it with what they have seen on Countryfile, or start telling me about their own connections with sheep, and men always seem to ask me if there is any Herdwick in it! The Slow Wardrobe is about making my own clothes, but it’s also about how we talk and think about fashion, and I love the conversations I get to have with strangers when I wear original Layter. 4. After many of us badgering you for a pattern, you later (heh) re-designed and re-developed Layter for publication. How did the second incarnation of the design differ from the first? And what did you learn from the process of redesigning and re-knitting? I was thinking about a garment that other people might really like to wear which could be paired with tailored trousers or a fitted shirt. To achieve a more flattering, figure-hugging garment, I re-knit Layter using exactly the same maths as in the original version, but at a much tighter gauge. The waist and hips are defined more dramatically and the rows of tight-knit garter stitch are very neat. The effect of this tidier, firmer fabric is a more formal garment, and something which is more like a jacket. In redesigning Layter I also abandoned the big puffy sleeves because I always felt they gave original Layter a slightly religious appearance which I find amusing, but which I wasn’t sure other knitters would enjoy! 5. 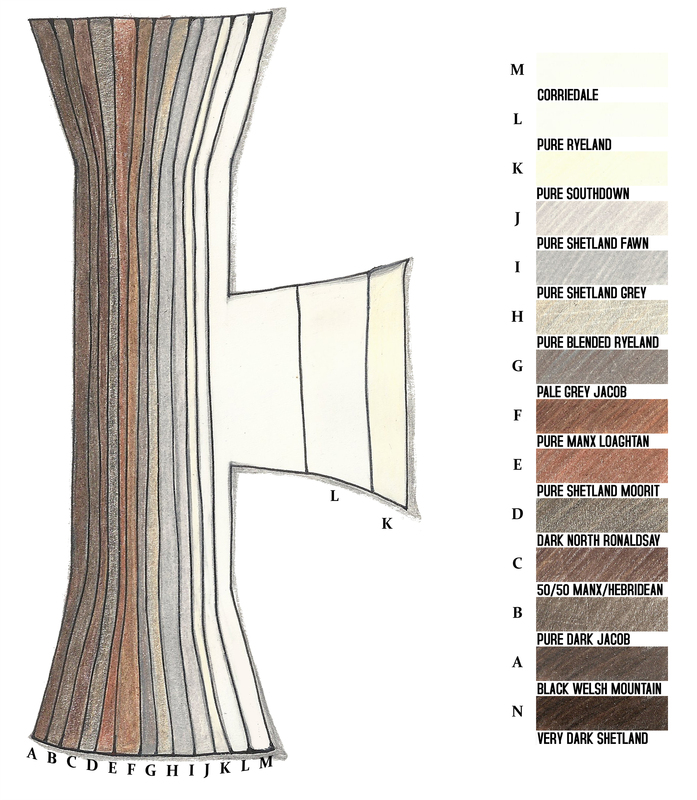 How many British sheep breeds and fleece shades are represented in the new Layter? What was your process of selection? And did you have thoughts of including more? The new Layter contains wool from several different sheep breeds – some of which are represented in multiple shades! 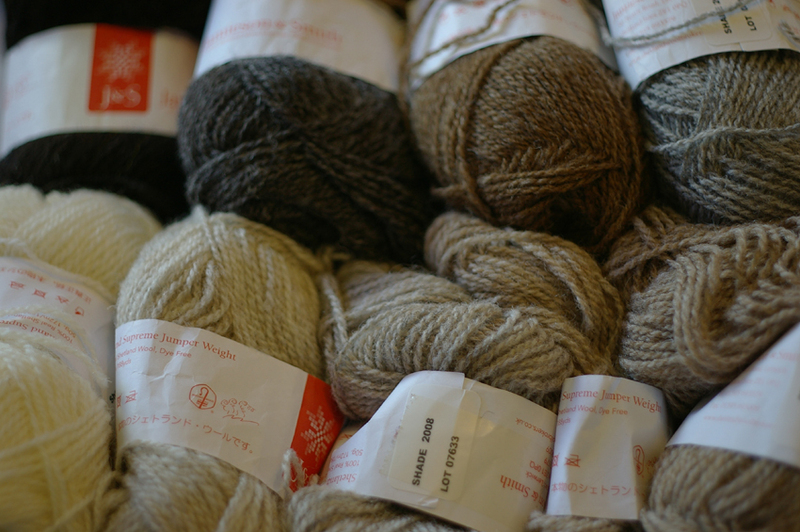 The full list contains Southdown, Corriedale, Ryeland, Shetland, Jacob, Manx Loaghtan, North Ronaldsay, Hebridean and Pure Black Welsh Mountain DK knitting yarn… nine discrete breeds in total. Carrying on the theme of the old Cumbrian counting words, I called that version “Covera” which means nine. I would like to do a further version which incorporates Herdwick, Rough Fell, Swaledale, Romney, Wensleydale and Cotswold, because this would create more textural contrast and if I made a version with fifteen sheep breeds in it, the corresponding word from the counting rhyme is “Bumfit” which I think is brilliant. Who doesn’t want a garment that fits nicely around the bum? ! 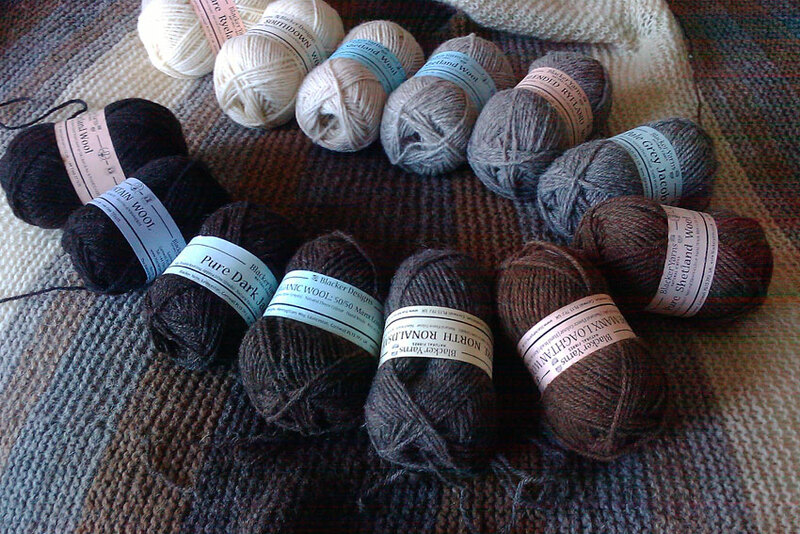 My process of selection involved lining up a lot of balls of Blacker Yarn, arranging them from dark through to light, and swatching to see which textures would work best together. The yarns used in the latest version are all fairly matt and hardwearing, and I got mildly obsessed with different shades of white while knitting it. The Corriedale almost looks bleached, while the Southdown is more ivory, and the Bluefaced Leicester is the softest of the bunch, and somehow mildly translucent! I played a bit with how to use these different whites through the sleeves and at the sides of the body. 6. Tell us about how the garment is constructed. Was it fun to design? 7. Layter has been an evolving project for four years now, and the latest stage in its evolution is Blayter (Baby-Layter) – an incredibly cute scaled-down version for infants and toddlers. Can you tell us about how this design developed out of your previous work on Layter? I am conscious that there are more modifications that could be made – more short rows; a side to side approach, eliminating the back seam – all modifications best understood through knitting practice rather than in the abstract! I felt a smaller version of the pattern would make it easier to test out these different ideas for this garment…a baby version was an obvious idea once I realised I wanted to continue tinkering with the construction, and playing around with colours organised into vertical stripes! 8. Does Blayter use the same construction method as the adult garment? The basic method of construction is exactly the same as for the adult Layter, but there are proportionately far fewer short rows because I didn’t want to create a lot of extra fabric to swathe a baby in. The neckband is also more gently shaped, and the sleeves are long enough to either come right down over the hands or to be rolled up out of the way. The gauge is quite tight, and again it is conceived of as a little jacket rather than a next-to-skin garment. 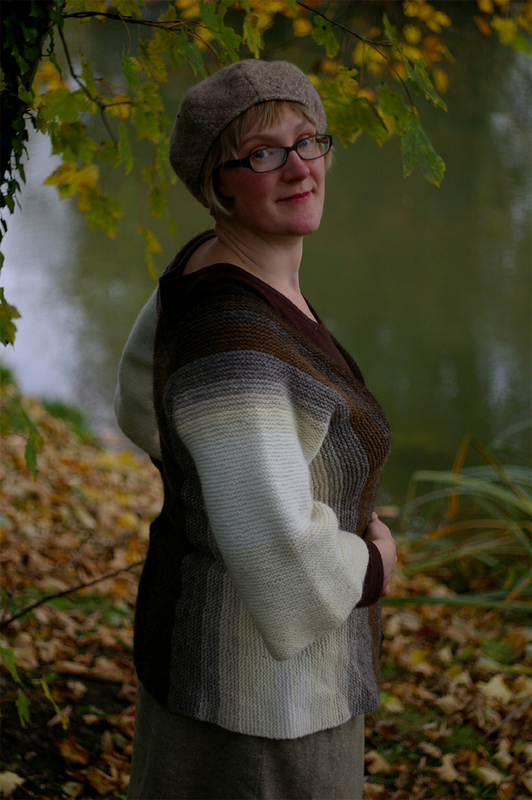 The name – as you have probably gathered – is a conflation of “Baby” and “Blayter”, although I did think about calling it Yann, because I only used the wool of one sheep while designing it! 9. What wool did you choose and why? 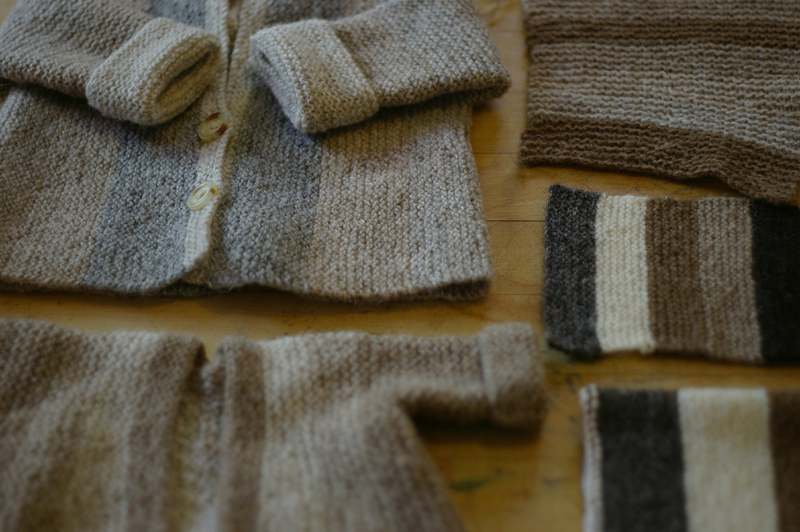 I chose to work with Shetland Supreme Jumper Weight from Jamieson & Smith because I enjoyed the soft hand of wool from the Shetland sheep breed when I was knitting Layter, and thought it would be gentle enough for a baby to wear. I also love the range of colours represented within the Shetland breed, and the Shetland Supreme palette offers the possibility to be quite subtle moving between greys, fawns, whites, creams… I started a high contrast version of Blayter which looked a bit like a mint humbug, but in the end was seduced by the subtle transitions possible between Shaela, Katmollet, Mooskit and Gaulmogot! 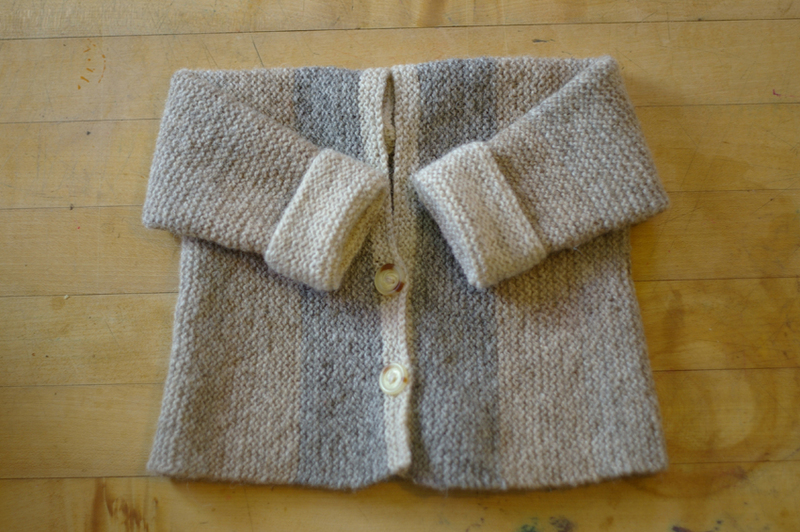 Shetland Supreme has a lovely light hand, and even knit at quite a tight gauge, retains a soft halo and bounciness… it’s lovely for a baby jacket. I also wanted to find a way of fitting the sheepy ethos behind the original Layter to the aims of Shetland Wool Week, which – like WOOLFEST – is such a fantastic celebration of sheep and wool! What better way than by designing Blayter in a way that celebrates some of the lovely shades of wool found amongst Shetland sheep? 10. What challenges did you find adapting the pattern for differently proportioned bodies? There’s lots of conflicting information about sizing from different sources, and this made certain aspects of the design process a bit tricksome. To assist with these challenges, I enlisted the help of our amazing friend Liz, who as well as being a brilliant tech-knitter, is an experienced knitter of baby things, and has produced many tiny and gorgeous items for her two lucky nieces. Liz was a total star and test-knitted a beautiful version of the pattern in berry shades of Jamieson & Smith 2 ply. She also discussed baby sizes and proportions with me, and made great suggestions for the details we included on the sizing chart, because in her experience, babies range wildly in terms of size/age. I learnt loads from her during the process of adapting Layter to fit a baby. 11. Finally, what is your favourite sheep breed and why? Ooh it’s a tricky one, that! Hard to pick just one as they are all so amazing, and all for such different reasons, but I have an enduring fondness for small, wild sheep like Shetlands, Manx Loaghtans, North Ronaldsays, Borerays… I am afraid I am terribly romantic about all these breeds. When I was in Shetland, Ollie showed everyone a hairy grey fleece which he described as “scadder” meaning that it’s very rough. I love that fleece, though, because it is what the Shetland sheep would grow if left to its own devices in order to survive in the wild. It has a thick mane down the middle which I imagine would give a ram a very proud aspect out on the hills! To me, scadder looks like land… like rocks, stones, earth, peat… On the other hand, who can argue with the lovely ginger-biscuit fleece of the Manx Loaghtan which is wild too, but surprisingly soft? Perhaps in the end though I have to say the Boreray is my favourite sheep, purely because it’s the most endangered breed, and the one we all need to love the most if we want to keep it going! If you’d like to celebrate WOVEMBER by knitting your own Layter, you’ll find the adult pattern here and the baby pattern here.